Well, there may be no red flag out today but the LAFD might want to re-think that one. I just spotted this smoke plume coming up from Griffith Park, just above the Los Feliz homes northwest of the corner of Los Feliz Blvd. and Riverside Drive. No news about it yet at the trusty LAFD blog, but keep your eyes out. Hmm. Either their directions are slightly off, or there’s some other fire burning near the Hollywood sign. This one’s close to a mile from there. According to CBS2, it’s on the Eastern side of Griffith park, between the 5 Freeway and Roosevelt golf course in Griffith Park, about two canyons east of the Greek Theater. Good news: the area burned about 10 years ago, so less brush to deal with. Also, plenty of hiking trails make it easier for firefighters to get to the fire. Helicopters have been dropping water on hot spots. Yep. That’s accurate from what I can see from my house. I guess the headline writer took some liberties. I spotted it from the Angeles Crest Highway about an hour ago. The smoke didn’t look to be much more than puff. And yes, it was about 10 years ago that it all burned up pretty good. Another update from CBS2: Winds have shifted and blown the fire into a more brush-heavy environment. Fire is now closer to the Wilson and Harding golf course. The fire has apparently moved close to the merry go round. Great view from Redondo Beach…anyone know if there’s a flikr stream yet? Got some neat shots. If I had a way to show you the pic I snapped from the Angeles Crest about 1pm I would…but its only one and not much more than a puff. Hope it is contained before property or lives are lost. Otherwise…a little fire is good for the ecosystem! I live near Griffith Park so it’s eerie to watch these news reports roll in. 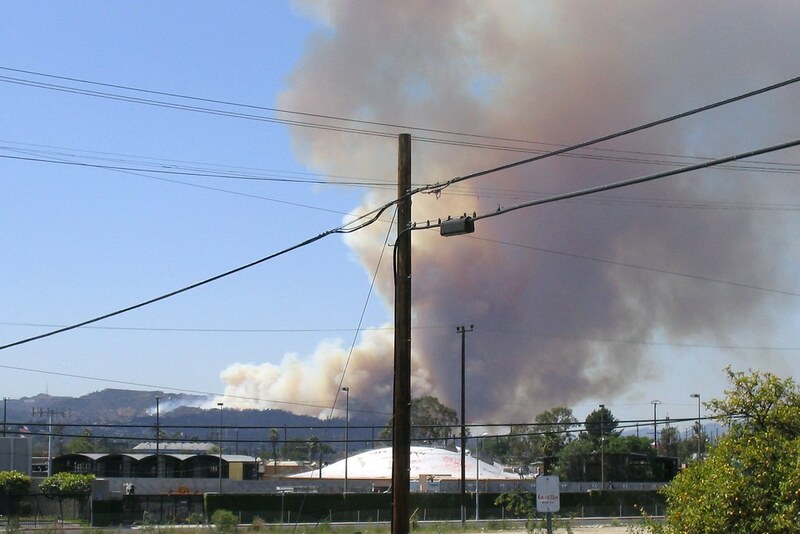 CBS2 is now reporting that the fire may be between 100 and 200 acres. Firefighters are defending the historic carousel. Autry Museum seemingly not in immediate danger. According to KCAL9, an arson suspect has been arrested. Arson…get a spit ready and roast him! The CBS streaming video requires Internet Explorer. It doesn’t work on my Firefox. Boo hiss. Thanks for the (many) e-mail messages seeking information about this fire. Though my name has appeared on LAFD blog postings this past month, they’re mostly ‘canned’ public service and safety messages prepared in advance (or from my home) during a nearly month-long work absence. I’m nearly recuperated from a nasty work-related foot injury, and hope to be back in the saddle in the coming days! Until then, my colleagues at LAFD Media and Public Relations (including some who were ‘volunteered’ to fill my vacancy) will be soldiering on, albeit at a less digital pace than you may be accustomed to. I’m appreciative of their efforts and your patience as we move steadily forward towards the peak of fire season. I posted a template on our blog from home. I trust my colleagues will keep it up to date. Previous PostPrevious Blogging.la Blow-Out Garage Sale!